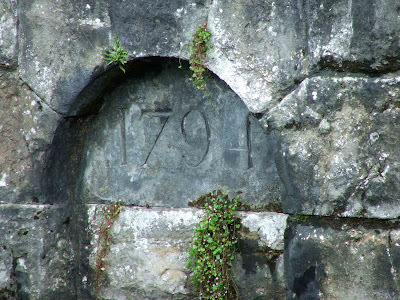 A 1767 act of Parliament allowed for some of Kendal Fell to be enclosed and administered by the newly formed Kendal Fell Trust. The area enclosed covered around 158 acres, and the trust were empowered to let out the land and collect rent. The act of Parliament stipulated that this rent should be "for the use of the poor there, and for cleansing and enlightening the streets of the borough." 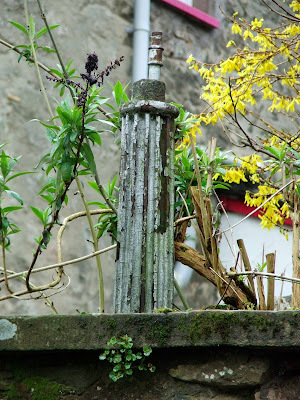 Before the advent of gas to the town, street lighting consisted of some 140 whale oil lamps. These types of lamp weren't very efficient and much of the town remained dark. 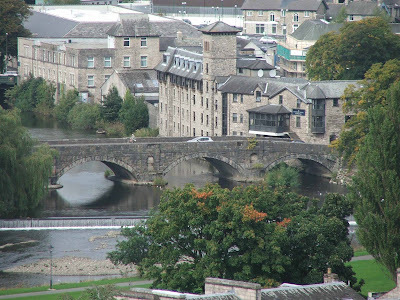 To upgrade the town's lighting system, Kendal Fell Trust set up the Kendal Gas Light and Coke Company, and the gas works were built. 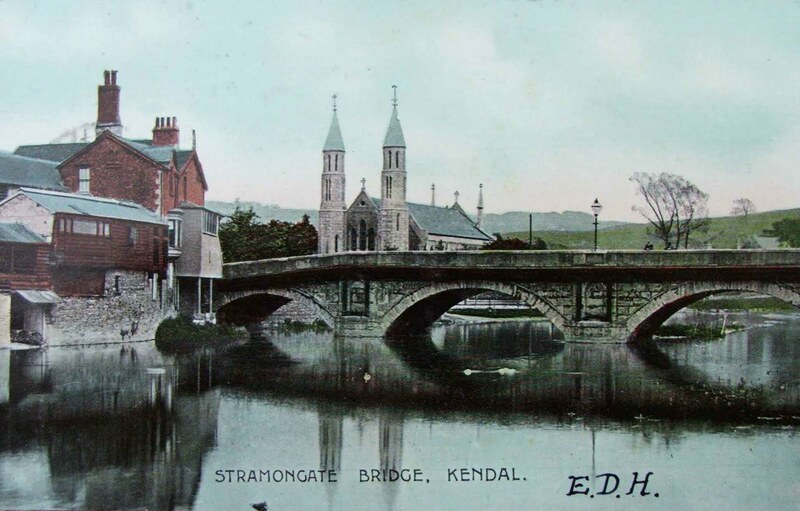 On Monday the 25th of July, 1825, Kendal's gas lamps were lit for the first time. A procession was held, marching through the town to celebrate this great leap forward, and it was attended by thousands of onlookers. By 1860, Kendal had a grand total of 132 lamps working on gas. It's reputed that the first lamps were not up to much, and a joke of the time referred to "lighting a candle to see whether the gas is burning or not". 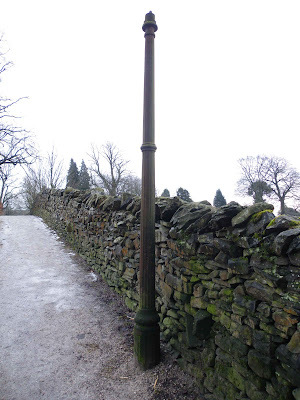 There are only a few of these gas lamps left dotted around town, and none of them seem to be complete. The ones that I've managed to find are all here, with a brief description of where they can be seen. Gas lamp on the Syke. Gas lamp on Cliff Brow. 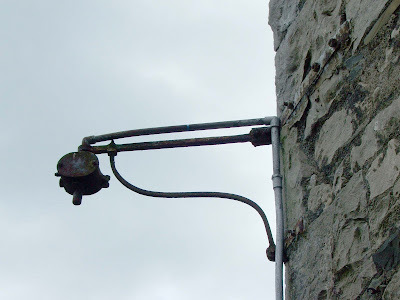 Gas lamp on Low Fellside. 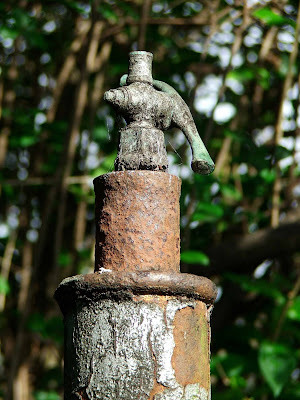 Close up of valve on gas lamp on the River Side near Bridge Mills. Gas lamp on the river side near Bridge Mills. 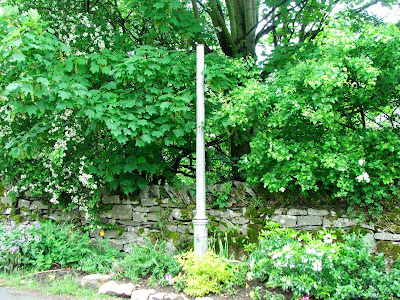 Gas lamp on Aikrigg Avenue. Gas lamp on Castle Street. 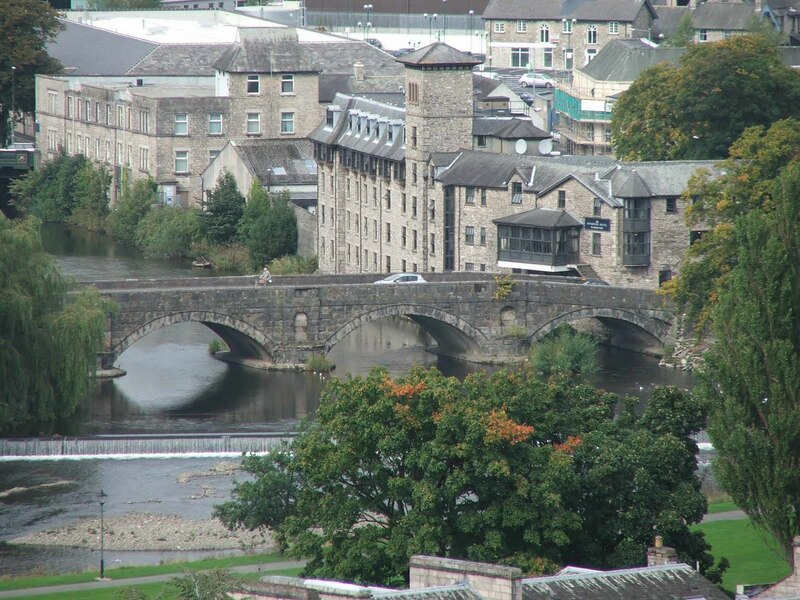 The gas works were built next to the Kendal to Lancaster canal, with a dedicated wharf where coal could be delivered to the works. The gas works had two holders, one being the reserve supply, with a combined capacity of twenty two thousand cubic feet of gas. 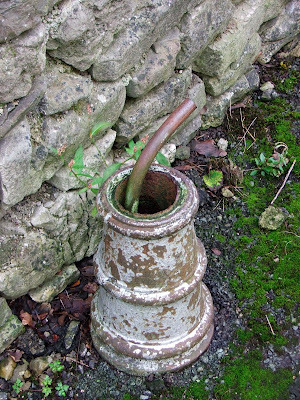 In 1849, Kendal Gas Light and Coke Company became known as the Kendal Union Gas and Water Company. The company has long since vanished, as have most of the buildings. The two gas holders have gone, but some stores, offices and workshops still exist on the site just off Park Side road. One piece of the site has been re-located to the Abbot Hall museum. 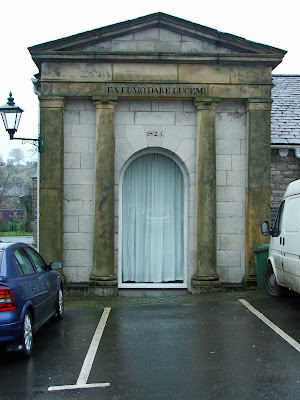 The facade of the meter house, designed by Francis Webster in 1825, was finally moved from the gas works to its new home when the site was cleared in 1984. The inscription on the head of the facade reads " Ed fumo dare lucem" which means "from smoke let light break out". 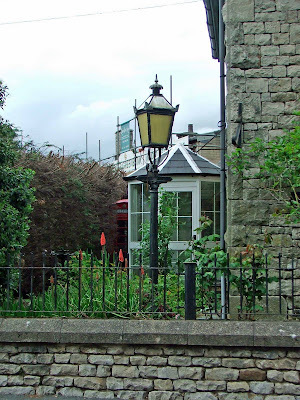 There are two gas lamps, both probably original, at Colin Croft in the middle of Kendal. Stramongate Bridge. Only the filled in hole on the parapet now remains. Bee boles are rows of recesses, most often built into South facing walls, in which a skep, a coiled straw bee hive would have been stored in the winter months. They can typically be found in all shapes and sizes, anywhere throughout the UK. These particular bee boles are situated in the wall that divides the old Booth's carpark from yard Yard 39\Tanner's Yard. There are three boles surviving. Each arched bole is about 1.25 metres high and wide and lined with lime plaster. 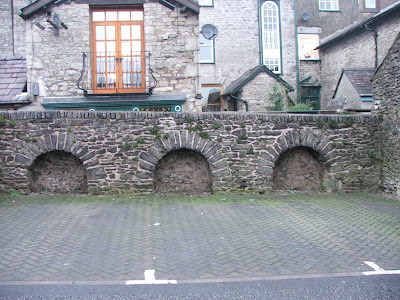 It's thought that these particular boles were built in the early 19th century. 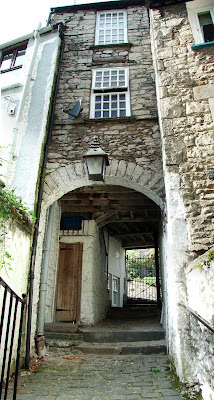 The above photo shows a possible bee bole in the wall of Chapel House at the top of Beast banks in Kendal. The IBRA Bee Boles Register has a good variety of bee boles from around the UK. Stramongate Bridge carries the A6 (Stramongate) over the River Kent and joins New Road with Wildman Street. The bridge is a medieval four arched construction, made up essentially of three road bridges amalgamated into one. Above. A view of Stramongate Bridge from Victoria Bridge to the North West. 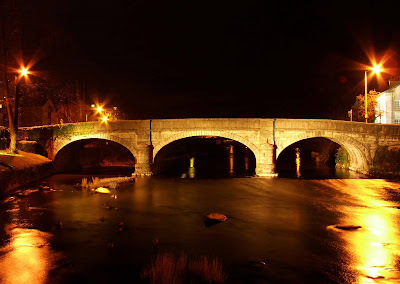 The original bridge is thought to date from the 14th century, although the middle section of the current bridge dates from the mid to late 16th century. It would appear that the original bridge was so well made, that when it was in need of repair, it was easier and cheaper for the town to build onto it rather than demolish and start again. Above. Stramongate Bridge from below the weir, looking North West. Above. The same view as the post card shown below. The above postcard, shows the bridge as it would have looked in the late 1800's (?) The church of St George still has its tall spires (now removed) and the building that is now the River Side Hotel, is the tannery. Above. Stramongate Bridge from Castle Hill to the South. The original design of the bridge incorporated steep approaches to the North and South ends, which caused problems in wet weather for horses hauling heavy carts across it. The approaches are still quite steep however. 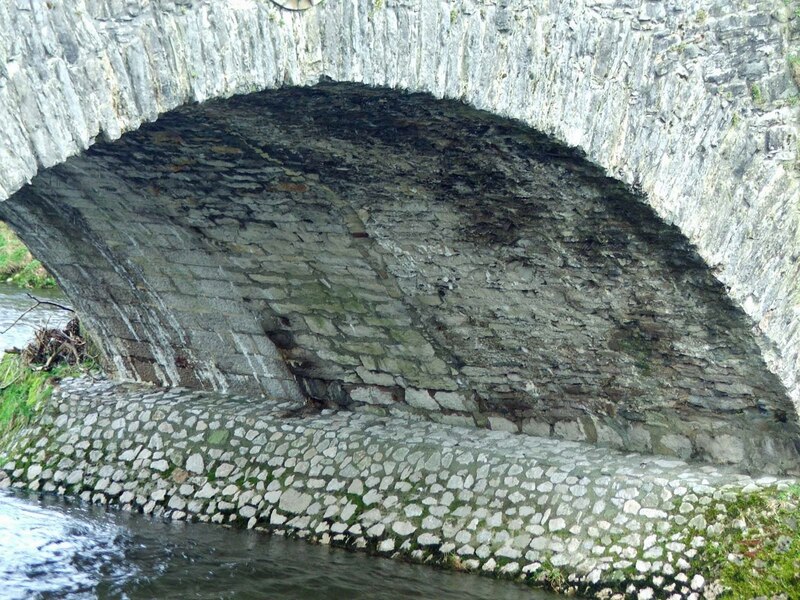 In 1794, the bridge was found to be in a poor state of repairs. 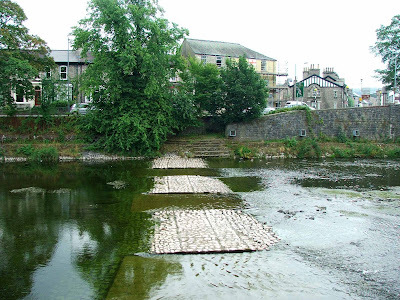 Kendal Corporation decided that they would build a new wider bridge. Above. 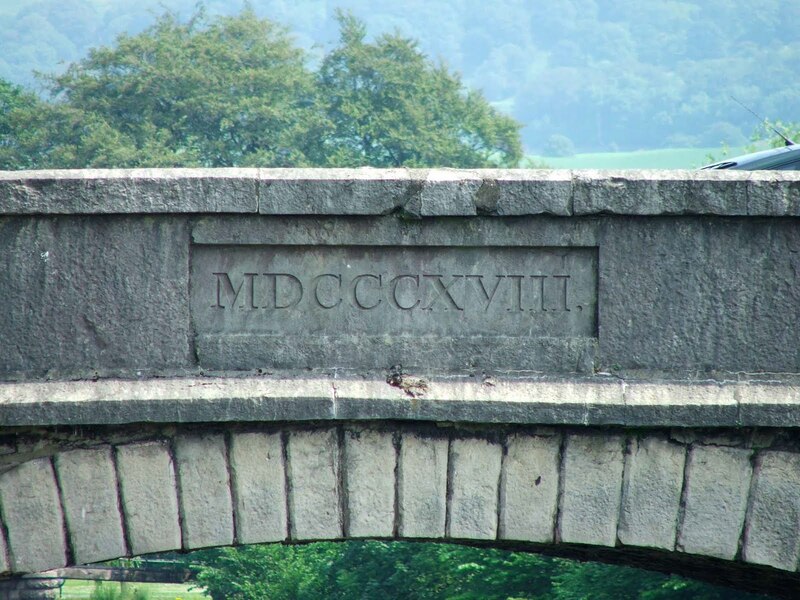 The date stone celebrating the rebuilt and consolidated bridge. Unfortunately, as the bridge was so well constructed it had to remain in situ.....which meant that an additional single track bridge was built each side of the original 'pack horse' bridge. The original structure was therefore encased in the new bridge. Above. The underside of one of the arches showing the original pack-horse bridge. 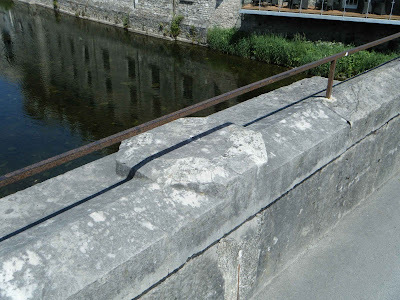 The photo above, clearly shows the position of the original medieval bridge, sandwiched between the two late 18th century additions. From this, the narrowness of the original bridge is clearly visible....far too narrow for modern traffic requirements! Above. A panoramic view of Stramongate Bridge from Goose Holme. Before the bridge was built, as at Nether Bridge, a ford would have been used to cross the river. 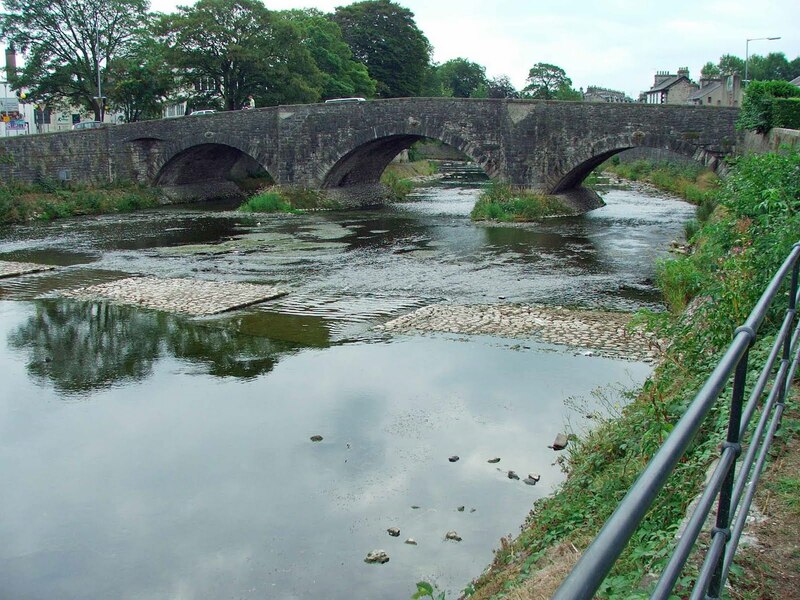 The ford was situated at the South side of the bridge, and would have crossed where the Bridge Hotel is now situated. 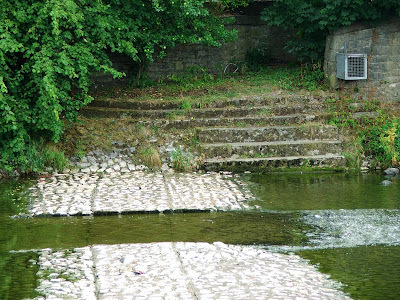 The ford was the site of the town's ducking stool, or the 'Cuckstool' overlooked by a watchman's box. The ducking stool was used to punish 'scolding women' who were treated the same as those who broke the peace. 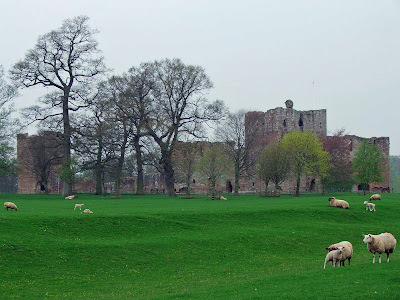 Brougham Castle lies on the South side of the A66 about 2 miles South of Penrith. The castle is situated in an area rich in archaeological sites….castles, towers, earthworks and ancient churches. The site was originally fortified by the Romans, who built a fort here between the 2nd and the 4th centuries. The remains of the fort, Brocavum, can still be seen as distinct earthworks, ditches and banks forming a large square enclosure beneath the castle remains. The fort can best be seen from the B6262, as here there are no castle remains and the Roman banks and ditches have survived to around three feet in some places. Remains of the Roman fort. 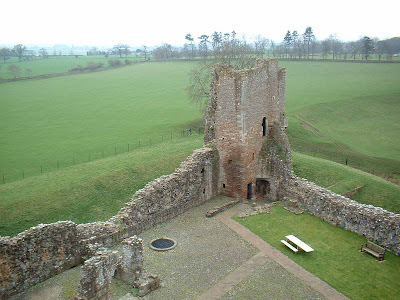 The castle is built in the North Western corner of the old Roman fort, and is thought to have been built some time (or continuously) between 1203 and 1228. The original defensive structure would have consisted of a keep and moat. In around 1246, Robert de Vieuxpont acquired the site and pressed it into service protecting King John’s northern lands against the Scots.. The castle benefited from natural barriers. 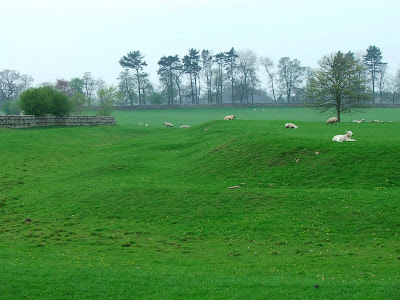 The site is protected on the North and West sides by the River Eamont and Lowther, although this element of defence has contributed heavily to the destruction of some of the outer walls and earthworks due to water erosion. This part of the river floods all too easily. The castle would have offered good protection for the river crossings and the roads running North to South, and East to West. Robert de Vieuxpont’s castle consisted of a stone keep together with some service buildings and a wooden palisade, but this was replaced with a stone curtain wall in around 1300 further strengthening its defensive qualities. It was at this time that the castle was governed by Robert Clifford. Robert’s father was the Lord of Brougham, a title he gained when he married Robert de Vieuxpont’s great granddaughter in 1268. Robert Clifford found himself heavily involved in the Scottish wars from 1296 onwards. 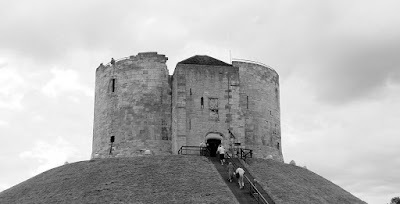 He was mainly responsible for work carried out on the gatehouse complex, the top storey of the keep, the addition of the Tower of League in the South West corner of the bailey, and the addition of more stone curtain walls. Such were the formidable defences at Brougham, it was deemed safe for Edward I to spend a night within its walls on the 22nd July 1300. An event that would have added much to the importance of the castle. 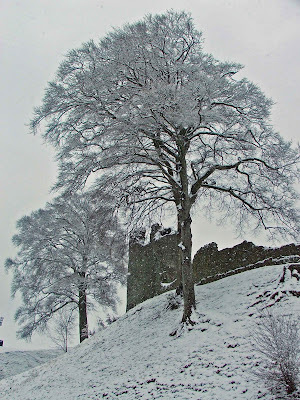 The 1340’s saw more work carried out on the castle by the Clifford family. This time it was Roger Clifford, grandson of Robert, who built the Southern portion of the curtain wall, and added a new Hall to the range of buildings. 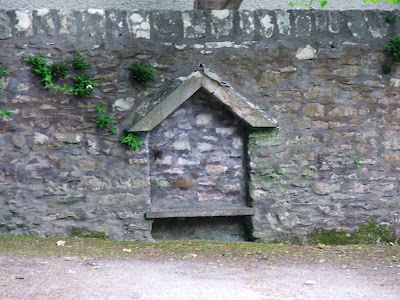 A small weather worn plaque can be seen embedded high up in the external wall of the gatehouse, signifying his importance to the castles beefed up defences. It reads “Thys made Roger”. The works that Roger carried out however, could not stop the castle being captured and sacked by the advancing Scottish army in 1388. Some records seem to indicate that it was around 33 years, in 1421, before the castle was back in use. The damage must have been severe indeed. During the Wars of the Roses, the Cliffords, who still owned the castle, fought on the side of the Lancastrians. Local rivals, the Nevilles, fought on the side of the Yorkists, and clashed on a few occasions with their Northern neighbours. 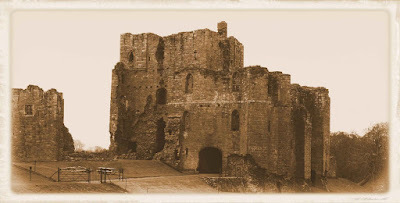 When the Lancastrian cause was lost, the castle at Brougham was granted to the Nevilles by Edward IV in 1461, as recognition of their dedication to his claim to the throne. 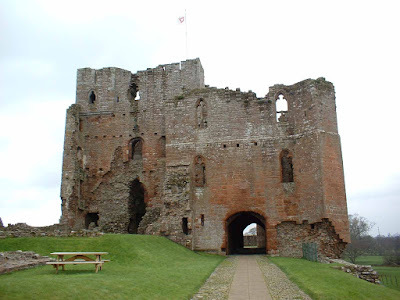 It wasn’t until Henry VII gained the throne, that the Cliffords regained the castle. From then on, the family prospered under Tudor rule. In 1525, Henry Clifford was made Earl of Cumberland, and his son, also called Henry, was born and spent most of his youth at the castle. Henry’s son George, the third Earl of Cumberland, was also born at the castle, in 1558. During George’s ownership of the castle, the site was unfortunately neglected. George spent most of his time at court in London where he was Elizabeth I’s champion. A 1595 inventory of the castle, states that the building was in a poor state of repair, with many of the rooms sparsely furnished, with some others full of rubbish. When George died in 1605, the castle became the dower-house of his widow, Countess Margaret. She died in 1616. A year later, in 1617, James I visited the castle, spending two nights there. It’s quite likely that the expense of entertaining the King was enormous. During the 1640’s, as the Civil Wars raged across England, Brougham was garrisoned by Royalist troops. However, it played no part in the wars. 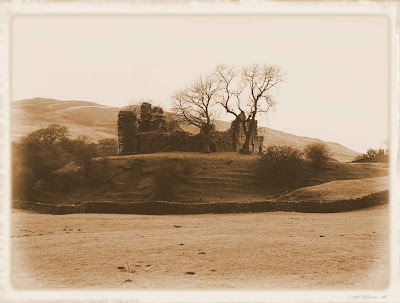 After 1650, Lady Anne Clifford gained control of the family fortune and the many properties throughout Cumbria. At Brougham she built a bake house and a brew house, and had substantial gardens laid down on the South side of the castle. These took the form of a huge walled garden, the earthwork remains of which can still be seen. She paid many visits to the castle during this period, spending many weeks and months there. 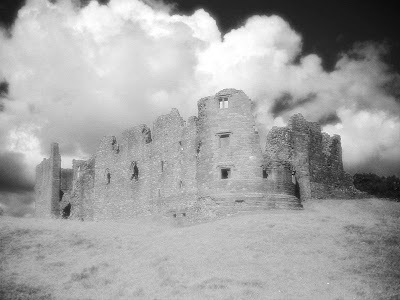 Lady Anne died on the 22nd March 1676 at Brough Castle. 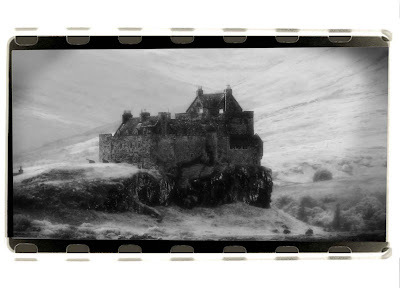 The castle was maintained for a few years after her death, with a man paid to clean the roofs and keep the rooms tidy. This arrangement finally ended in 1714. By this time, the Earl of Thanet, Thomas Tufton had decided that he didn’t need all of the ancestral homes that had been left to him. 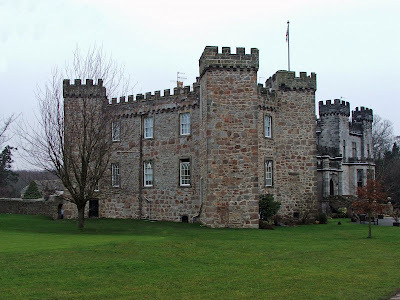 He made Appleby Castle his prime residence, and set about selling and dismantling the other properties. He sold all the furnishings and fittings at Brougham in 1714, leaving only the Tower of League furnished. He raised the grand total of £570. In 1723, even the Tower of League was sold, raising £40 5s. 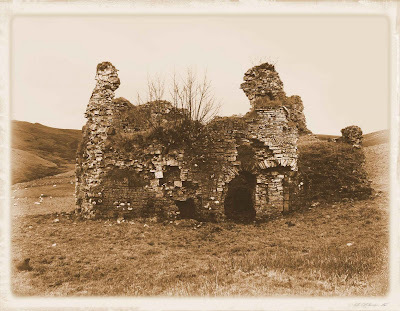 The castle, neglected and empty, quickly fell into ruin. In the late 1840’s, the Earl of Thanet carried out some half hearted repairs on the remaining structure. His successors, the Lords Hothfields however, decided that the cost of maintaining the castle was too much, and the cash dried up. By 1859, cattle were seen to be grazing within the huge gatehouse. There were a few visitors to the site, and they frequently complained about the poor state of the castle. In 1928, the castle was placed in the ownership\guardianship of the Ministry of Works. Much of the 1840’s repairs were undone, with the masonry put in place by the Earl of Thanet removed. The castle was returned to its original Lady Anne Clifford form. Today the castle is in the excellent guardianship of English Heritage. The castle is open from April to September, and through the whole of October. Well worth a visit. There were a number of bridges, all made of wood, that stood on the spot that Francis Webster's three arched bridge now occupies. All were carried away in floods until in 1743 the town finally built a stone bridge to withstand the frequent floods. The present bridge joins Gulf Road and Lowther Street with New Road and Aynam Road, and provides access across the river to the town from the East banks of the Kent. Above. Miller Bridge from the West. The planning and building of the new bridge by Francis Webster, would put most planning and building projects to shame. 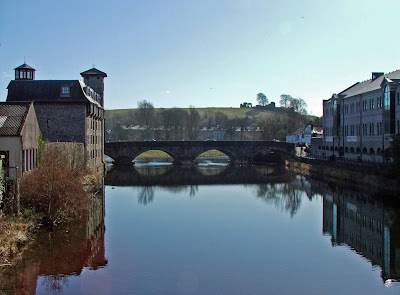 On the 13th of April, 1818, Francis Webster was approached by the Kendal Corporation appointed Lancaster Canal Committee, to submit plans for a replacement bridge of the Kent. He was instructed to prepare plans for a bridge, and to advertise for contractors to be ready to build the bridge by the 4th of May that year. 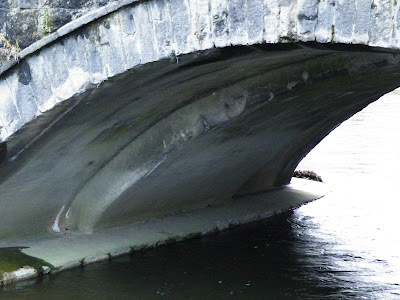 Webster submitted plans for a three arch dressed stone bridge with a total span of 130 feet in under three weeks!!! Above. 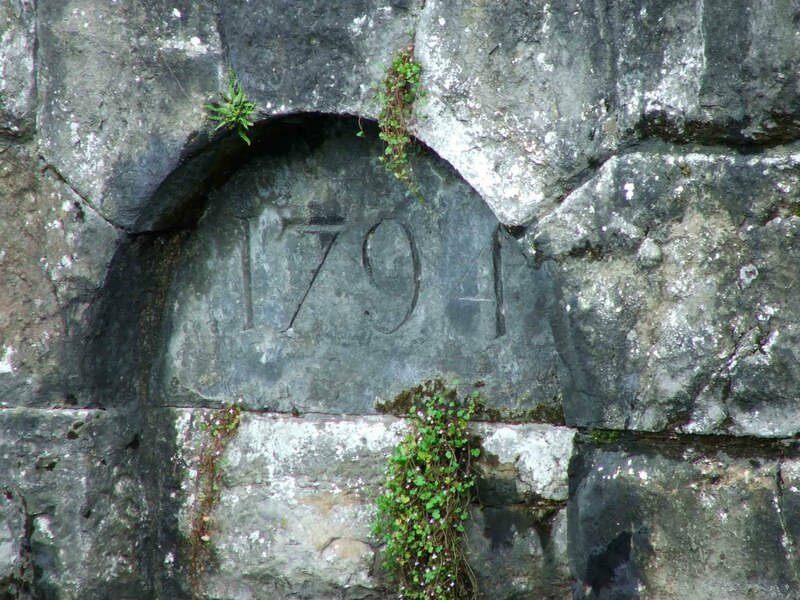 A close up of the date stone on the West face of the bridge. Prices quoted for the building of the bridge, ranged between £797 and £1500. It was decided that Edward Gibson and Jas. Harrison, stone masons, would build the bridge, at the price of £888. 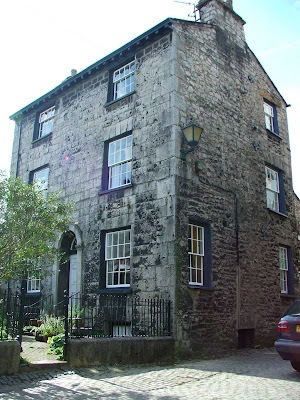 The foundation stone was laid on the 20th of May 1818 by Francis Webster the designer and also Alderman of Kendal at the time. The bridge was opened to traffic in November of the same year. It took a mere 8 months to plan, organise and build the bridge. Above. 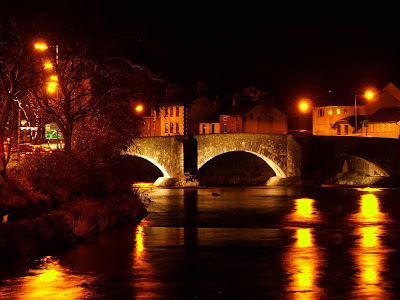 Miller Bridge from the West at night. Officially, it was called Kent Bridge, but in 1833, when John Wood produced his map of the town, the bridge had been named Mill Bridge. By 1877, it had become known as Miller Bridge. The latter names has stuck. An original rough pencil sketch of the bridge by Francis Webster survives to this day, although the actual plans have long since vanished. Nether Bridge joins Kirkland to Lound Road and Aynam Road. 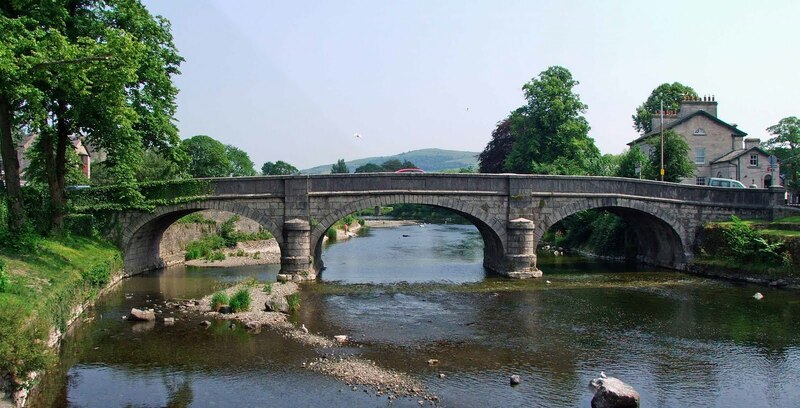 The bridge is a three arched structure spanning the River Kent, made up of essentially three bridges, replacing an old ford that can still be seen to its North. Above. 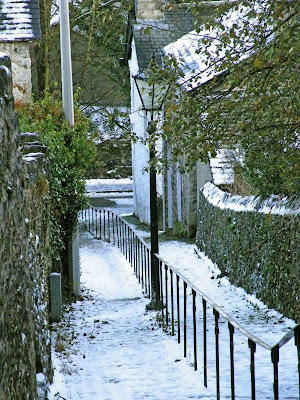 A view of Nether Bridge from Milnthorpe Road looking North. The name Nether is derived from the Anglo Saxon word Neothera, meaning Lower. The name indicates that this bridge was at one time the last bridge in town. This is now no longer the case, as the Romney Road bridge is the last bridge. Above. Nether Bridge at night. 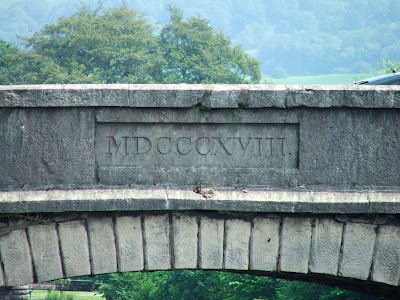 The earliest known name for the bridge, albeit an earlier structure, was the Caput Pontis, or the 'head bridge'. 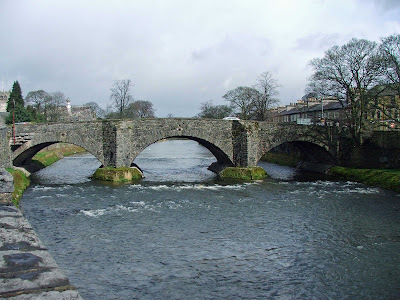 A document dated 1376, states that permission had been granted to the town of Kendal, to charge tolls for traffic crossing the bridge. 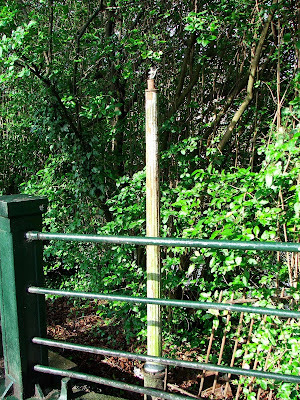 This right of Pontage raised money for the upkeep of the bridge. Above. The steps down to the ford on the East bank of the Kent. The document also states that the bridge was only wide enough for one cart to cross at any one time. The pointed alcoves that can still be seen today, would have allowed people to stand out of the way of passing carts as the crossed over the bridge. Above. The ford across the Kent. 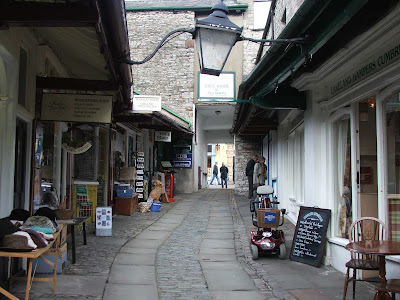 Before the turnpike roads connected Kendal to all the towns in the region, it has been estimated that around 345 packhorses a week came into the town across the bridge, and 30 wagons twice a week from Lancaster alone. Above. Nether Bridge looking South with the ford in the foreground. In 1772, the decision was finally made to widen the bridge. Three weeks after the work was completed, and Kendal marvelled at its newly refurbished bridge, the structure was washed away in some of the worst floods the town has ever seen. It was subsequently rebuilt, but whilst work was still underway, wagons, carts and people were forced to use the ford that can still be seen today, running along side the bridge. The steps can still be seen on the East bank of the river. Above. The underside of one of the arches showing the three different periods of widening. The bridge was further widened again in 1908, and the three phases of building can plainly be seen beneath the arches. The oldest section of the bridge is to the south, the middle section is the 1772 work, and the north section is the 1908 work. Above. 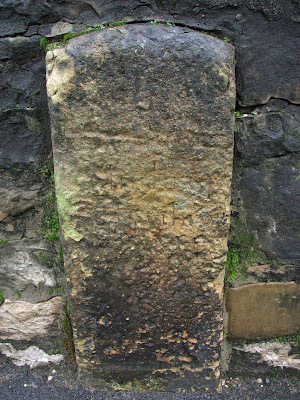 The much worn mile stone on the Western wall of the bridge. On the Southern corner of the bridge, where Milnthorpe Road starts, a weathered mile stone can still be seen set into the bridge's wall.The stone probably dates from the 1700's, and is so badly eroded that it's impossible to read what's written on it.